Today is the last day of January. Tomorrow will be the first day of February. Tonight will mark the exact middle point of the two month stretch I probably like the least on the calendar. Don’t get me wrong though, saying “like the least” when referring to the calendar year doesn’t say much. I love life and cherish each day, no matter what month it falls in. However, while I will frequently tweet out “I love the month of ________” for 84% of the calendar months, I don’t do it for January and February. I like them, I just don’t love them. I don’t know if this revelation comes as much of a surprise to most. After all, a few years ago I did write about how much I love the month of March, mostly pointing to the fact that it means January and February are over. Also, many know that I am a lover of light, sun, and warmth. While living in Myrtle Beach definitely exposes me more to the latter two items than where I have lived before, the short days can be a bummer. I feel this stretch is the least appealing from January 10 through the end of February. It is challenging to come to grips with the college football season ending, the novelty of the new year fading, and the darkness of nights minus the beauty of Christmas lights predominating. While Sidney’s birthday, the Super Bowl, and Valentine’s Day are all great things to look forward to, I usually need to find additional ways to bolster the luster of the first and second months of the year. How do I do this? For me, I try to really focus on goals. I give January and February extra worth by focusing on personal objectives. I use my new year resolutions to propel me through the 58 or 59 days that start off the year. I use the motivation of the brighter and more carefree months ahead to make me buckle down and focus on the ones I am living in at the moment. Nothing can make January or February more meaningful and worthwhile than when you improve yourself. I try to liken the two months to a training period. I tell myself that if I put everything I have into the training period then the best ten months of the year will be especially rewarding and fun. No matter what, January and February set the tone for the year. We can decide to “just get through them” or we can decide to make every minute that falls within them worth it. For those of us who don’t adore January and February, take comfort in the fact that we are half way through the time period. However, also use it as motivation to diligently work on yourself for the next four weeks. Pretty soon March will be here and the signs of Spring will start popping up. It is important to emerge from the darkness stronger than before. Don’t Blink. The Revenant – This past Sunday, Sidney and I went and watched “The Revenant.” I wanted to briefly mention it just because the movie is a big Oscar contender. I enjoyed the movie and found it interesting but I don’t think majority of the population would. In my opinion, I think most will probably find the film slow in parts and rather primitive. 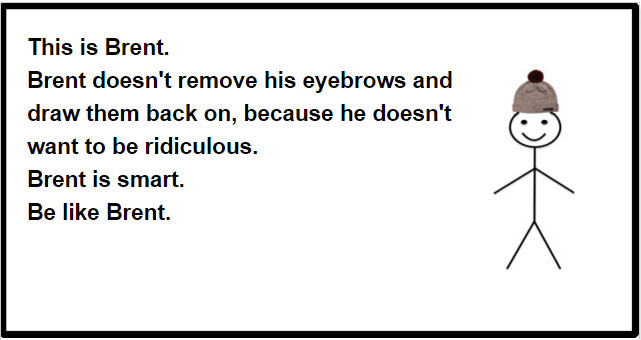 I am a Leonardo DiCaprio fan but I prefer movies where he actually has a personality. I know he had to exert every ounce of his energy to make “The Revenant” but I don’t think effort alone should get you an Academy Award. 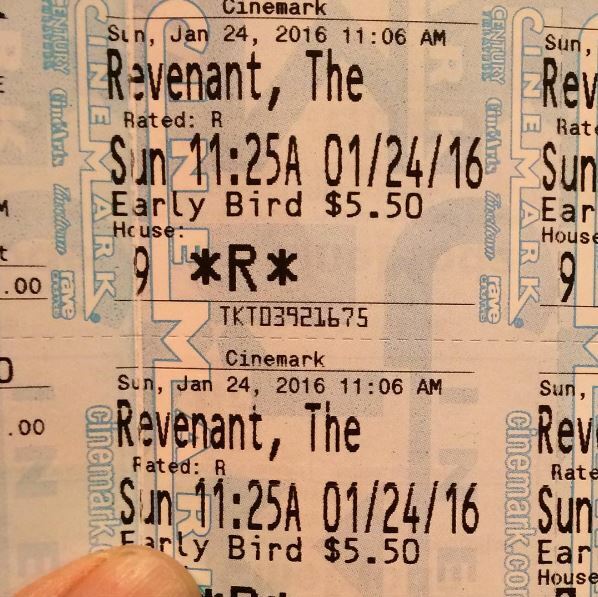 Our “The Revenant” tickets from Sunday. Happy Birthday, Sidney – Today is Sidney’s birthday! I went to her school this morning and brought “Miss Mathis” lunch while her students watched us the whole time. This evening we will celebrate with her family. As I mentioned in a Facebook video I did for her, this is the year of her life where she will get married! Happy Birthday, Sidney! I am pointing at you Sid because it is your birthday! Facebook Anniversary – Today is the nine year anniversary of when I joined Facebook. Next year I will probably dedicate a whole blog post to the one decade mark of when I got my feet wet with social media. Would you believe that I was a hold out when it came to joining Facebook? I included this most recent “Life’s Little Instruction” because it is obviously outdated. 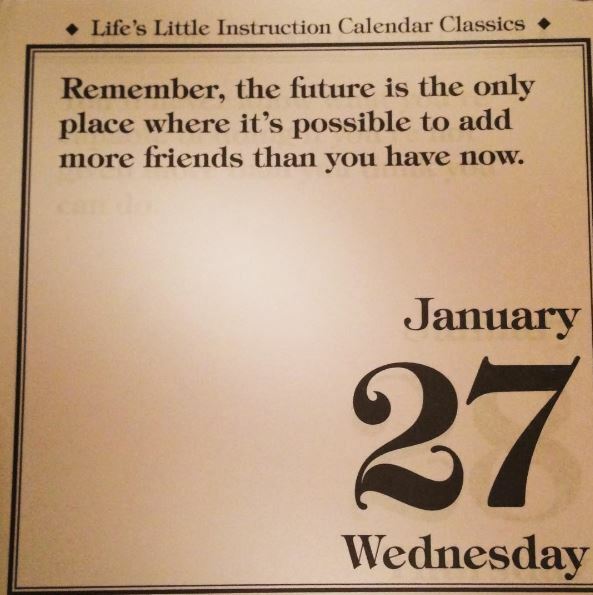 It should really read Remember, the future AND social media are the only places where it’s possible to add more friends than you have now. Brutal Fights – I came across a tweet today where a certain person said she observed her dad watching street fight videos on Facebook. I found this kind of funny because when I went home for the holidays, I noticed my dad taking my mom’s tablet and watching street fights off of her Facebook account. For those who don’t know, these fights are brutal affairs that take place in neighborhoods and other urban areas. I don’t have the stomach to watch them (I alone hate UFC) but apparently it seems like dads in their late fifties enjoy them. I choose to tap out. Wedding Update #17 – When I booked our honeymoon a huge weight was lifted off my shoulders. However, another important groom responsibility was still on my plate….a rehearsal dinner plate that is. At times it was a frustrating process trying to find a venue for our rehearsal dinner but I finally found a spot. Our wedding party will be dining at Thoroughbreds the night before the big day. Thoroughbreds is a steakhouse and seafood grille located on Kings Highway in Myrtle Beach. The restaurant is beautiful, it is close enough to church, and it can handle a group of our size. I am glad to have this selection made. Well I got to go celebrate my fiancé’s birthday! Have a terrific weekend and thanks for taking time to read my blog. Don’t Blink. When I heard the news that Donald Trump had pulled out from tomorrow’s GOP debate in Iowa I admit that I was surprised. Of course he had threatened to “no-show” for several days now but I thought it was just a ploy. I told myself he was doing the same song and dance he did with CNN several weeks back. I don’t like Trump’s decision to not debate. I know his move is calculated. I know his team methodically looked at every possible scenario. I know his supporters are confident. But as someone who has watched Trump’s entire campaign in awe, this is one decision that I particularly don’t care for. In fact, I flat out don’t like it. The main reason why I love the debates so much is that it is competition at its finest. To me, it is as if the debates are a simulated athletic contest. Competitors (debaters) prepare for the event, battle butterflies before it begins, perform when the lights are on, and answer to how well they executed afterwards. It is a grueling process that tests a person. 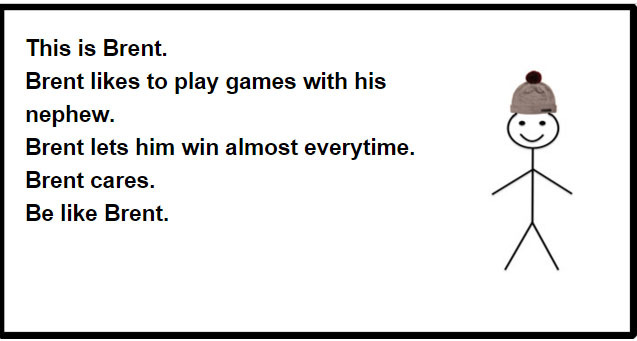 Training, showing up/executing, and taking responsibility are all given components of participating in a sporting event. At the bare minimum, this is what you know for sure you will have to do. None of these three realities are easy. It takes a lot of heart. But as any athlete can tell you, several other factors will also test one’s strength. By “other factors” I mean competing in a hostile environment, not feeling 100% on game day, battling unforeseen equipment/field issues, fending off problems not related to the sporting competition, doing your best when an opposing player/team might not be playing fairly, etc. And oh yes, one other obstacle that athletes routinely face is when they look at the game assignments and see who will be officiating their game. Don’t kid yourself here, players form quick impressions on what officials do a good job and which ones don’t. Even competing in high school I had my own short list of referees I didn’t want to see out on the field. I thought they were unfair. But so what? Every single athlete, including myself, went out and still played the game. To me, Donald Trump is flat out refusing to compete and I don’t like it. He is no longer training for the debate. He won’t put himself out there on the stage tomorrow in front of millions of people watching at home. He won’t subject himself to the stress of answering questions and challenging his competitors. He won’t have to answer to and evaluate his performance once the debate concludes. However, the worst part of his refusal to compete is his reasoning for doing so. I get that he doesn’t like Megyn Kelly. I get that he believes she is unfair. I get that he feels she has no place to moderate the debate. But deal with it! Do your absolute best to overcome the adversity and show up at the debate venue on Thursday night. Use her presence to motivate you. Plan for the line of questioning she will deal to you. Don’t pout and quit. Instead, rise to the occasion. Using the excuse of “she doesn’t treat me fairly” just doesn’t cut it with me. We all have faced circumstances where we had to perform under the perception that we were not being treated fairly yet we stuck it out. I think Trump should do the same. As I said, I know the Trump team believes this move will help them. However, I don’t see how. If I lived in Iowa and was beating myself up over whether to support Cruz or Trump on Tuesday, I don’t think the decision would be that hard anymore. I think most Iowans would side with the person who respected the process and had the decency to show up for the debate. We shall see. Don’t Blink. For my last birthday, Sidney bought me an Apple TV. This device allows me to watch Netflix and stream programming from countless networks and services. I have really grown to like it, especially now since the depressing lull in the sporting calendar has arrived. Each day last week Sidney and I watched a different movie via my Apple TV. Who chooses which movies we watch? Well, we actually do it very diplomatically. Most of the time we will just switch off on who selects the film. Monday night Sid would choose, Tuesday night I would choose, Wednesday night Sid would choose, etc. Occasionally, we will even concede the choice on our appointed day and beg the other to make the selection. As you might expect, we choose drastically different movies. Sidney opts for romantic comedies and family movies. I like the horror movies, thrillers, and documentaries. But perhaps even more contrasting than what movies we select is how we select them. For as long as I can remember, I have selected the books and movies I consume by relying heavily on my gut and minimally on actual information. When I select books at the library, I might read the first couple sentences of the inside cover and make my decision right then. If I like the setting and the very basic premise of the book I will take it home with me and start reading. I hate to have the plot laid out for me beforehand. I like to discover it myself as I read through and not have ideas swirling around in my head about what is going to happen. I want to be just as surprised with the plot as I am about the ending. I get even more extreme with movies. When I choose a film for Sidney and I to watch I will quickly glance at its summary and running time and then press play. I depend on this extremely brief primer to generate that gut feeling in me that the movie might be watchable. Sidney: What is the movie called? Sidney: What is the movie about? I literally choose movies so quickly and effortlessly that I don’t pick up a movie title or a basic summary of what it is about. By now it should go without saying that when I see a movie in the theater I never read about it in the newspaper nor read reviews. For me it just takes away the suspense and fun. As I mentioned, Sid is the exact opposite. When she chooses a movie on Netflix she will look at the star rating and then get her phone out to look it up. She will do actual research. She will know the film’s title, cast, plot, and, I imagine, the ending. She knows very well what she is getting herself into. What is kind of crazy is that we are usually both opposite of the roles I explained. Sid is the self-proclaimed “spontaneous” person while I am more methodical. When it comes to vacations, restaurants, and other experiences, I am looking at websites and searching social media for as much information as possible before making a decision. I try to leave very little to chance. Thinking about it, I might just use books and movies as my excuse to be a little rebellious. Another Netflix movie will most likely play tonight. What will the film be and who will make the choice? You might just have to return in a couple days to read my Thursday Rundown to find out. Don’t Blink. Go ahead and follow the hashtag of any televised athletic contest and you will read tweet upon tweet absolutely ripping the play-by-play and color analyst personnel. Some of the commentary from Twitter users about the commentary of the broadcast team can be downright ruthless. Forget the ire directed toward the participants on the field (players, coaches, officials), the real hatred that is served up in 140 character bombs is catapulted right at the broadcast booth. Because I am a good American, I toss my fair share of ammunition as well. I loathe the work of Cris Collinsworth on NBC’s Football Night in America. I think he tries his very best to devalue the superb work of his partner Al Michaels by soiling it with his own arrogant drivel every single Sunday night during the NFL season. As much as I try to calm my thumbs, I end up tweeting a few gems each year blasting the incompetence of Collinsworth. But I must concede that in the back of my head I know that I am being a jerk. In reality, the people who analyze the games in millions of living rooms each week have expertise and training. They know their stuff. Some viewers love them and some viewers hate them. Serving as a sports analyst, especially on a national stage, is a polarizing job. It just comes with the territory. This is a time tested answer to the “annoying” national talent on the television but I think what I do is better. I just mute the television period. Alternative broadcast be damned. I do this for a few reasons. First, there isn’t a more objective way to watch a sporting event than in complete silence with no influence. When I watch people send out tweets, so many of them more or less regurgitate what the broadcast crew said. They don’t know it, but the color analyst they claim to hate is actually giving them all their material. The times that I watch a game in silence I am able to provide fresh insight that a million other people aren’t racing to send out. I also tend to watch games in silence just because I can’t take the screams, the squeals, the catch phrases, and the back-and-forth of the play-by-play call. This right here is not a critique on these announcers, it is more of a shot directed at my nervous self. Sometimes when I watch one of my favorite teams play I am already enough on edge that I don’t need the stress and excitement from the people in the booth. My final reason for muting broadcasts is just because these days I find myself multi-tasking when watching sporting events. I might be reading, blogging, or talking on the phone. I am more successful doing multiple items at once when there isn’t constant chatter in the background. I find myself doing as much busy work as possible when there is an NFL game on NBC. I know watching a sporting broadcast in silence is not a new concept (especially if you go to sports bars). I am aware that a network actually experimented with it once before (although they still had the game sounds transmitted, they just didn’t have a broadcast crew). But I don’t know if everyone is aware that they can simply press a button to get rid of a broadcast booth nemesis. While I don’t recommend trying out this method for the Super Bowl, it might be something you consider doing during the NCAA Tournament. Just whatever you do, please don’t ever mute this blog. Don’t Blink. 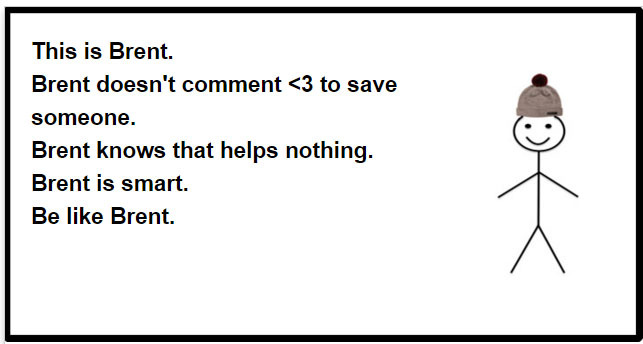 Quite frequently something will come along on Facebook that everyone seems to do. It can be a survey to see how many states you have been to, a test for color blindness, a status that you copy and paste, a special avatar commemorating a movie or cause, and/or a game where you try to get the highest score possible. For those of us who can claim Facebook membership for at least a half of a decade, we all know that these things come and go. Everyone will tell you that I actually am very ridiculous. 1. I am amazed at how Blobla has swept across Facebook in record time. I saw my Facebook friends sharing their individual “stories” yesterday for the first time. Today, it seems like my newsfeed is completely dedicated to them. Usually a Facebook trend takes a little bit to catch on; not completely engulf the service like wildfire. 2. I don’t get it. I know by posting this on my Facebook profile also won’t help anything. I hate to be that guy who cuts down the cool thing that everyone seems to be having a lot of fun with but I will pass on Blobla. Okay, let’s just call it for what it is: A simple format meme that just spits out random junk. It doesn’t check your profile, it doesn’t attempt to create something based on your characteristics, and it doesn’t output something that is aesthetically pleasing. It reminds me exactly of Bitstrips minus the creativity and personalization. I never let anyone win, not even my fiancé. What probably bothers me the most (even though it shouldn’t), is that some think Blobla is actually made to legitimately describe you. It is the perfect example of the power of suggestion at its finest. “This is Fred. Fred likes to go to the grocery store. Fred likes to buy food at the grocery store. Fred is smart. Be like Fred.” Hey, that is totally me!! Give me a break. Again, I don’t want to work myself up too much with this. After all, I take pride in not letting social media changes and trends rattle me. I just go with the punches and adapt. However, please forgive me if I say that Blobla is the stupidest Facebook gag of them all. Don’t Blink. 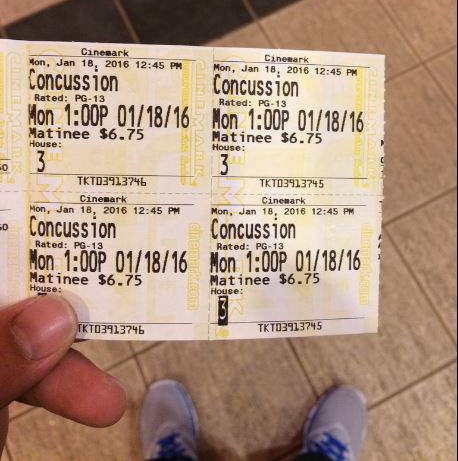 Our “Concussion” tickets from this past Monday. 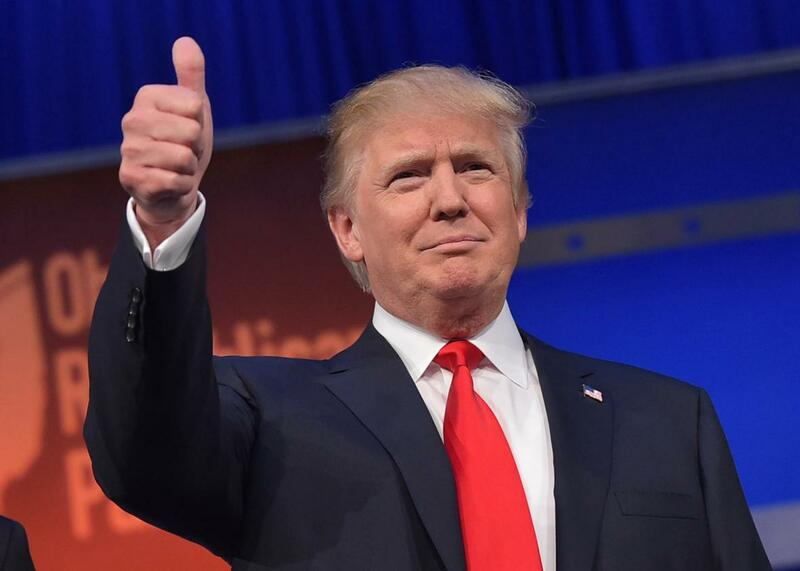 Trump – Sorry to all my readers who despise him but I can’t stop talking about Donald Trump! Each day he seems to grab the headlines and increase his stock. I am observing this all in awe. Again, this is not because I idolize the guy but rather because I admire his calculated strategy. I have to give him credit and say I was very impressed with his debate performance last week. His improvement from the first debate (where I ripped him) to the one this past Thursday was remarkable. As we get closer and closer to Iowa, the race keeps getting better and better. “Super Size Me” – It only took me about 13 years to finally see one of the most famous documentaries ever made. Last evening I sat down and watched “Super Size Me.” I enjoyed watching the filmmaker go to different McDonalds restaurants around the nation and stuff his face. I also found the history and interviews contained in the documentary very interesting. However, I didn’t take his results too seriously. I would have found it more intriguing if he went on a McDonalds diet but didn’t super size everything and also found the time to exercise a few times a week. I think the filmmaker was too set on proving his point that McDonalds is terribly unhealthy. I mean come on, I could gain just as much weight by going on a “mother’s cooking diet” where I only ate large portions of my mom’s food and didn’t exercise A diet that was somewhere between Jared’s Subway diet and the super size method mixed with some physical activity would have produced a better documentary with more impactful results. 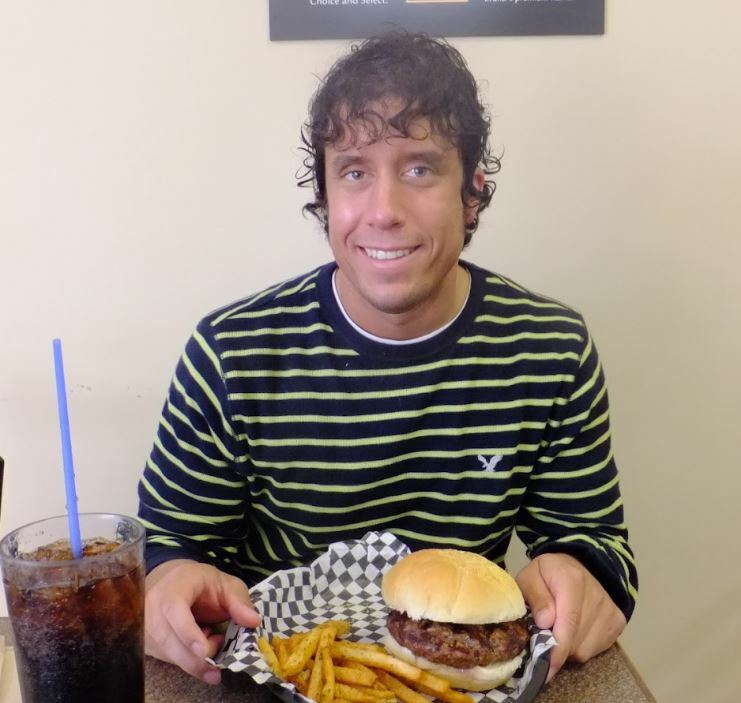 In honor of a documentary about eating hamburgers, here is a photo of me just about to eat a hamburger. Super Bowl Choice – It hurt watching the Seahawks get eliminated last weekend. I was thankful though that Seattle actually made a game out of it after trailing 31-0 at the half. No questions asked, I definitely want to see a Carolina Panthers vs. Denver Broncos Super Bowl. When it comes to the NFC rep, I want to see the team repping the Carolinas make it! The Panthers have had such a good year, I would like to see it culminate in a Super Bowl appearance. As for the AFC rep, I detest the New England Patriots so much that the motivation to see the other team advance is already there. Adding more to my case for cheering for the Broncos is that I am a Peyton Manning fan and I would have no problem seeing him reach another Super Bowl. 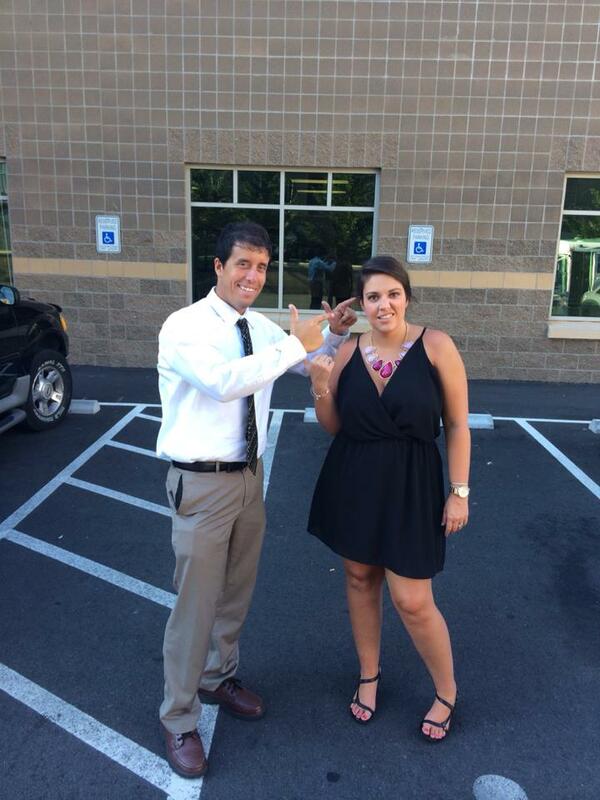 Wedding Update #16 – I do have a significant item to report in this latest update…I booked our honeymoon!! 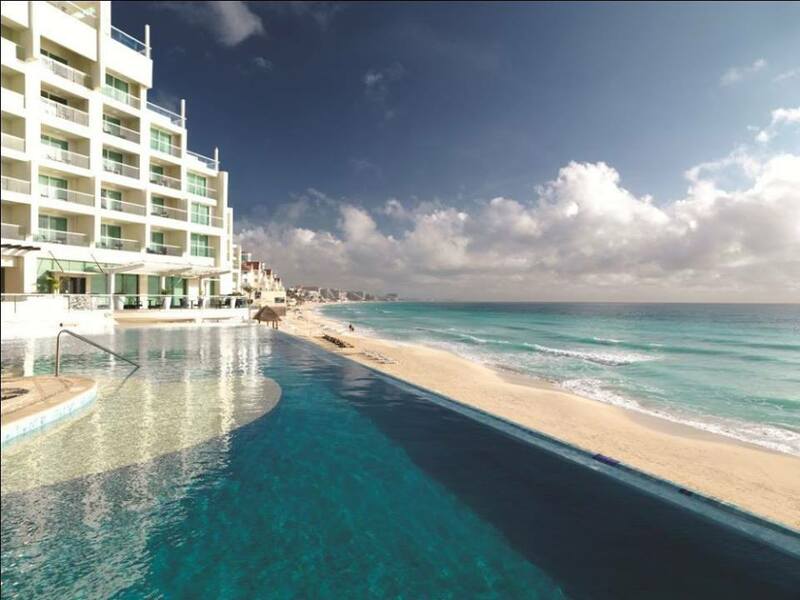 After much research and discussion about what we exactly wanted, Sidney and I will be staying at the Sun Palace in Cancun. We ended up booking with the Sun Palace because it is a couples only resort and it consistently appeared high on lists ranking the best hotels in Mexico. I depend on Instagram to gain honest feedback on hotels/restaurants/venues/etc. and everyone I messaged remarked that Sun Palace is nothing short of superb. Take a look for yourself if you want, we can’t wait to go! We will be going to a resort that is basically made for honeymooners…the Sun Palace. Take solace in the fact that the days are getting longer. Late January might not be the best time of the year but each day is a gift. Have a great weekend. Don’t Blink. This is a different topic and one that is kind of difficult to explain, but I want to try to type out a few words about it tonight. Sometimes when I am exposed to a small amount of unfavorable stimuli, it makes my brain work. I end up thinking about how the unpleasant sensation I experienced would feel if it was 100X worse. This morning I went to take a shower in the locker room after my workout. For whatever reason, there was no hot water today. The water that gushed out of the shower head was ice cold. I did what I could to dodge the stream while washing myself but there is only so much you can do if you really want to get clean. I had no choice but to stand under the shower head when the time came to wash my hair. The unforgiving freezing water seemed to send my body into shock as it splashed against my head and funneled down on my shoulders and back. The cold shower seemed to take my breath away. As I walked from the shower area to my locker, a vision played in my head. I was visualizing myself ice fishing. I could see a blizzard type situation in -20 degree temperatures. In the middle of this picture was a thickly frozen over lake with a circle cut out in the very middle. I visualize myself fishing in the circle, icicles forming on my face. Suddenly, the ice cracks and I fall in. My body sinks in deep unforgiving freezing waters and I slowly drown. How would that feel? I take the uncomfortable moment I had just a couple minutes ago and realize that thousands of people have experienced moments much, much worse than what I just did. Although my recent moment felt unbearable at the time, others have really known what it is like to be cold. Have you ever stood too close around a bonfire when someone adds fuel to it? The byproduct from the flames might touch your skin and at that moment you realize there is nothing more savage than raw heat. The feeling of getting burned or almost getting burned is torturous. The times I have felt the whispers of flames made me think about one thing: burning to death. I could not fathom going out that way. Having flames pass by my body is brutal enough…but being engulfed in them? One final example. Every now and then I will have a tough time sleeping because of nightmares. I will lay in my bed and the second I close my eyes the bad dreams immediately start. When nightmares overcome you in the middle of the night nothing is scarier, even if you will just be able to laugh them off in the morning. It is at these points in the dark of the evening that I realize a tiny fraction of what hell must be like. To me, nothing is more miserable than feeling paralyzed by fear. I rarely go this deep in my blog posts but my shower today really seemed to “wake me up.” No matter how in pain or uncomfortable we are, things could always be a lot worse. Don’t Blink. I had a couple other ideas to write about this evening but a moment happened about 30 minutes ago that I feel I need to devote a short blog post about…no matter how stupid it makes me look. I left Sidney’s house to return to my apartment. About 20 minutes, or roughly 11 miles, separate our residences. As I departed her place I knew I needed to get gas as I was on empty. I pulled into one of the gas stations close by her home. I exited my car, pressed the button to open the mini door to my gas compartment, and screwed off the cap. I inserted my debit card, keyed in my pin, and chose my fuel grade. I then took the gas pump in my hand and moved it toward the fuel entry. I never pay much attention to when I insert the gas pump into the entryway of my car. I just jam it in. However, when I did it today the pump was met with a thud. The hose part of the gas pump was blocked. Thinking it was some type of freak occurrence I tried jamming it in again. No luck whatsoever. I tried again…no entry. Taking my finger I tapped the metal flap that covers the entryway. It moved effortlessly. Hmmmm? Obviously the metal flap wasn’t malfunctioning. I used my finger to open the flap while trying to stick in the pump. It wouldn’t work. It appeared as if I couldn’t keep my finger there long enough to open it up before the pump wiped my limb away and the flap closed. I started to think about the work I had done on my car just a few days ago. I had my battery replaced at Wal-Mart and it took forever. Did the workers extend the job to try to mess with me? Did they tamper with the gas compartment? I had another idea. I took one of the ballpoint pens I carry with me at all times and tried to use that to open up the entryway so the pump could fit. Despite my best efforts and quick reflexes with my pen it wouldn’t work. By this time my hands were covered with black scuff marks and coated in gasoline. Again some thoughts started to swirl through my head. I was running low on gas, I needed to re-fuel somehow. Luckily I had Sid and her family close by but what would happen if this problem persisted? Would I need to take my car in again? Would I have even enough gas to get there? Today is a holiday so good luck on finding a mechanic. I couldn’t try to let my near-empty tank last me much longer because not only is it 20 minutes to get home but it is also a 25 minute commute to work in the morning. How much would it cost to fix a bizarre problem like this anyway? I just booked my honeymoon this weekend. Not looking to spend more money. At that moment my eyes immediately widened! Could it possibly be? Was I really that dumb? I was looking my stupidity right in the eye. If I was correct in my thinking, I had attempted to use the DIESEL PUMP at the other gas island. This time around I made sure not to use the diesel option and went for the other pump. It fit right in the entryway and the gas poured freely. A crisis was averted. The coolest thing I learned in this ordeal is that people smarter than me make it impossible for idiotic motorists to put diesel in their cars. I had to admire this well-thought out protection while getting over my embarrassment. I will take the small hit to my ego; I don’t have car troubles like I originally thought and that is a great way to end the holiday weekend. Don’t Blink. The only other place I would rather be today than Myrtle Beach is 170 miles northwest in Charlotte. The Seattle Seahawks will clash with the Carolina Panthers in a divisional playoff game inside Bank of American Stadium at 1:05 p.m. ET. 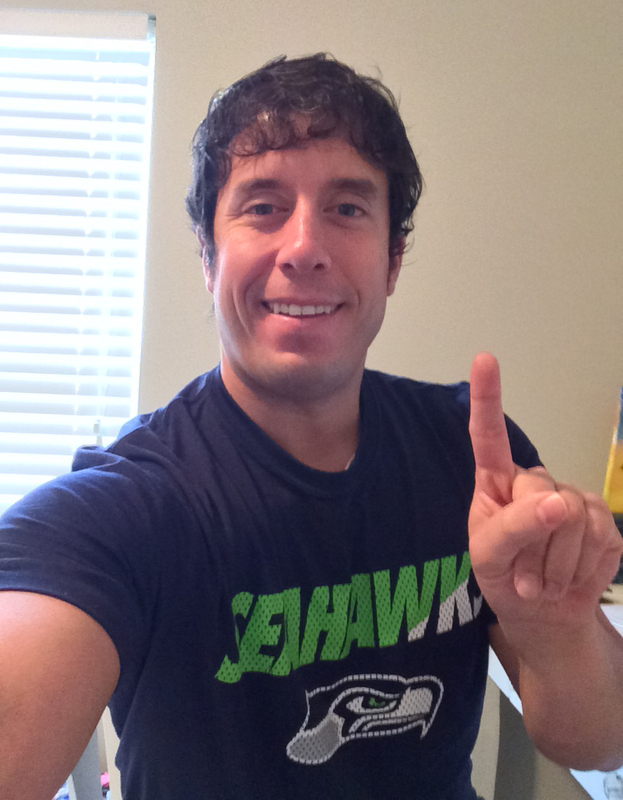 Why did I let the minimal drive stop me from representing the 12th Man? Well, when you are fresh off booking your honeymoon you have to scale back a bit. I am ready to cheer on the Seattle Seahawks today! This afternoon I will be watching the Seahawks vs. Panthers game with Sidney’s family! Why did I put an exclamation point at the end of that previous sentence? Yes, you guessed it, they are Carolina fans. Sidney’s family always entertains on Sundays and today they are centering the festivities around the big game. Because they are such great people I knew they wouldn’t shun me just because I am a Seahawks fan. However, I thought I may have pushed my luck when I dressed Sidney in a Seattle Seahawks shirt a few weeks back when we were in Spokane. 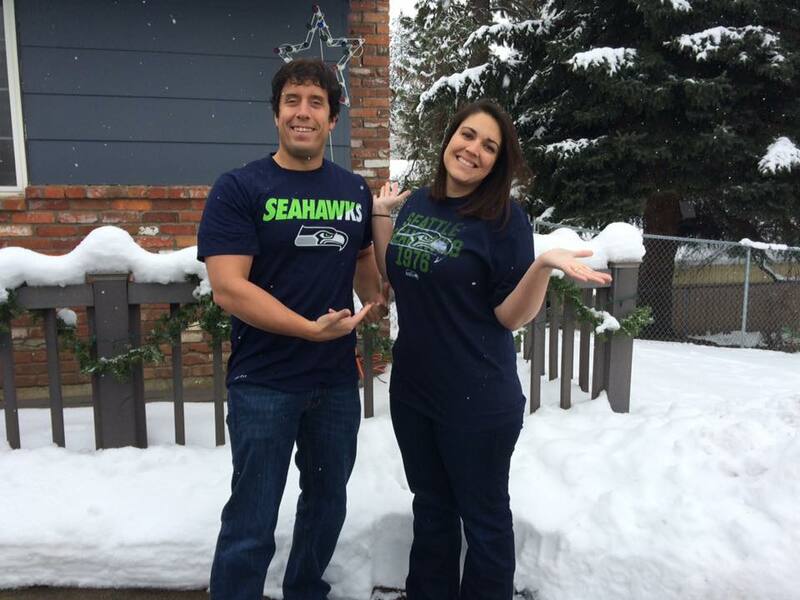 My natural fan allegiance was one thing, but purchasing apparel of the rival team for one of their daughters to wear? In some family circles, that could ended wedding plans right there. Some families would consider this crossing the line. Okay! So while I might be in the minority today in terms of my rooting interest, I will hardly be in hostile territory. It should be a fun afternoon. Don’t Blink.